Registration Space limited; advance registration required. Register by phone at 414-446-8794. The Lawn and Garden Series moves indoors for a workshop that makes decorative use of the things we find in our gardens in the autumn. Work with Jan Alba and Dennis Lukaszewski to create seasonal containers and swags that can be used indoors or out. Jan Alba has been an active Master Gardener Volunteer with SouthEast Wisconsin Master Gardeners for more than 25 years. She has been in the employ of the University of Wisconsin-Extension, working with the Urban Agriculture and garden rental program, for 21 years. 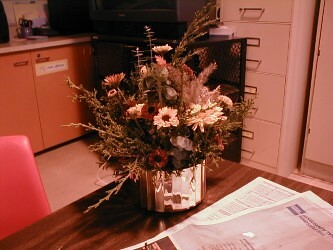 While working alongside Dennis Lukaszewski, she has learned that many seasonal floral arrangements can be crafted from otherwise expendable garden refuse. Dennis Lukaszeswki has had three successful careers: as a banker, a floral designer and floral shop owner for over 20 years and, most recently, as a registered landscape architect who works at the Milwaukee County UW-Extension. Currently the director of the Urban Agriculture program at UWEX, he oversees the design, operations, and education of the UWEX community gardens, as well as the gardeners at peripheral partner sites. He has always been a champion of the "reduce reuse recycle" mentality and regularly incorporates much of his waste greenery in his designs.